Zabel comes to DISA from the Air Force CIO/information dominance office, where she spent roughly the last year as director of cyberspace strategy and policy. Prior to that role at the Pentagon, she served as director of command, control, communications and cyber at U.S. Transportation Command. She also previously commanded the 75th Air Base Wing at Hill Air Force Base, Utah, per her DoD bio. 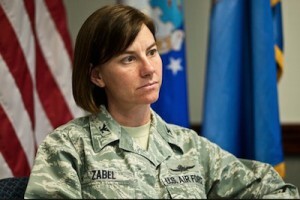 “In this role, she helps to lead a global organization of military, civilian and contract personnel who plan, develop, deliver, and operate joint, interoperable, command and control capabilities and a global enterprise infrastructure in direct support of” key organizations including the White House, the Defense secretary, the Joint Staff and combatant commands, according to Zabel’s DISA bio. As vice director Zabel coordinates leads an 8,000-member global organization and manages a $10-billion-dollar annual budget.